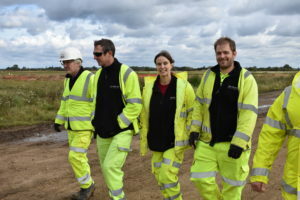 Excavating an overall area of around 350 hectares (1.35 square miles), the team working on the archaeology of the A14 Cambridge to Huntingdon improvement scheme is made up of a range of specialists from across the UK and Europe. Headed up by MOLA Headland Infrastructure, with archaeologists from Cotswold Archaeology, Oxford Archaeology, Pre-Construct Archaeology, Albion Archaeology and Cooperative Archeologia from Rome, the 250-strong team are revealing how the Cambridgeshire landscape has been used through the ages – from the earliest hunter-gatherers to the communities living along the A14 today. Our experts are finding innovative ways to process and analyse the huge quantities of archaeological material and data. We are also developing a number of innovative archaeological skills programmes. 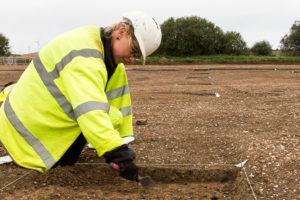 Graduate training, continuous professional development (CPD) and accredited membership of the Chartered Institute for Archaeology are the focus for our ongoing work-based learning. So who are the people behind this massive undertaking? I am Ramon and I am a Geomatician. It is my job to survey archaeological sites. 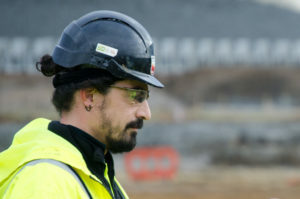 I have come from Spain, where I qualified and gained a lot of experience excavating Roman sites. Since working on the project, I’ve been surveying ditches on a site near Bar Hill, using our digital equipment and I am now a Supervisor. The data I collect details the position of the archaeology to fit into an overall plan for the site, so we can decide which areas need detailed excavation. I’m Bonnie and I recently graduated as an archaeologist. I live locally, that’s how I found out about the project – it’s really on my doorstep! Here I am excavating one of the 1 metre square test pits on a site just north of Brampton. We take them down 10cm (4 inches) at a time and there are plenty of finds, like animal bone and pottery. The finds I am uncovering are starting to give us a picture of how people lived and worked here in the late Roman period. Valerio is from Sardinia, Italy and has been here for one year working near Bar Hill. It’s an interesting challenge and is his first time living in the UK after many years with his University in Sardinia. In his role as an Assistant Supervisor, he has to manage the complexity of how features fit together and to help to make decisions on how to excavate them. With 10 or 15 nationalities in the team, there are new systems to learn, different backgrounds and personalities – you really need to build the team. There have been opportunities to mix the best of UK and European methods to solve the stratigraphy of the site. I’m Emma, a Senior Archaeologist and one of the project management team of four. 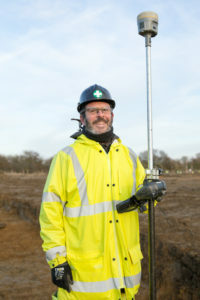 Day to day, I manage our section’s field staff through the site supervisors, analyse and report on the archaeology, deal with all sorts of day to day issues and communicate regularly with the client and county archaeologist to report on our progress. I have to make sure that work is done according to the agreed Written Scheme of Investigation, on budget and in time.